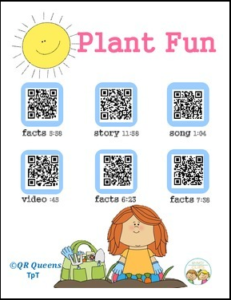 Learning about plants is so much fun when learning with QR Codes! There are so many interesting facts to learn and cute songs about plants! This is an awesome activity that can be easily adapted to children of various ages and needs. It is also good for differentiation instruction. It’s a great way to incorporate technology into the classroom. Check out our QR Codes (made in safe share) to explore the world of penguins! Just SCANthe QR Codes on the task card using any device with camera capabilities (such as a Smart Phone, iPad, iPod, etc.) and watch your students immediately become actively engaged while exploring and learning interesting facts about plants via songs and stories.